Listen to the stories of the past 30 years! Elsie Moss's granparents used to live in one of the houses built on the land that is now Walworth Garden. Robert Hadfield, a former board memeber helped set up Walworth Garden 30 years ago. Kevin Williamson; a current trustee and one of the many people who helped create Walworth Garden. To put the garden into context we firstly have to delve deeply into the sands of time! The Walworth Road lies between two higher gravel sites that cut through the low-lying marshes on the south side of the Thames. These were used as foundations for two routes laid by the Romans; Watling Street (including the Old Kent Road) and Stane Street (including Kennington Lane). The marshland was also interrupted by three areas of higher ground; of these, Walworth Street (later Road) became the route south, known also as the Road to Camberwell. Walworth has Anglo Saxon origins. First mentioned in the Domesday Book (1086), a jester named Hitard (or Nithard), who entertained at the court of King Edmund was granted the land at Wealawyrd (Walworth). In 1052, before Hitard went on pilgrimage to Rome he made his land over to ‘the Church of Christ in Canterbury’. Canterbury Cathedral retained ownership until 1862 when Walworth was given up to the Church Commissioners and later in the C20th to the London County Council. London’s market gardens: The area has always been an area of gardens and was once part of the larder of London providing fresh produce and flowers for the city. Maps of the 1780s depict Walworth as a pleasant country neighbourhood, with newly formed roads stretching across the gardens and fields. Walworth was famous for its peaches and its garden. Hence, we have the name of the Newington Peach! In 1776 James Maddock had just started to use the land below as Walworth Garden (see image below, courtesy of the Cuming Collection) as a flower growing business. This was the first place to be called the Walworth Garden. Immediately to the south was John Bendel’s Montpelier Tea Gardens and Tavern (1770s-1840s) with about five acres of “trees, shrubs and other plants”. See the image below courtesy of Southwark History Library which shows the location of the gardens in relation to the Walworth Rd. The Royal Surrey Zoological Gardens: Pleasure gardens in London have a long history, and were especially popular in the 18th century. Vauxhall Gardens, not far from here, was one of the most famous pleasure gardens and all types of people flocked to its, sometimes notorious, entertainments. For centuries royalty and nobility had kept private zoos and menageries (as collections of animals were known). One of the oldest menageries in the world was at the Tower of London. ‘Walworth was a real community in those days and there was never any need to visit the Walworth Rd as everything was on the doorstep. The area was made up of 3 or 4 storey houses with multiple occupants. You would get a flat when you needed one from Yates on the Walworth Rd. 70% of the people were Londoners with a large Irish minority. During the ‘60s and early ‘70s everyone had a job and the people of the area were a close-knit working class community.’ (extract from an interview with Kevin Williamson, garden founder and Trustee). 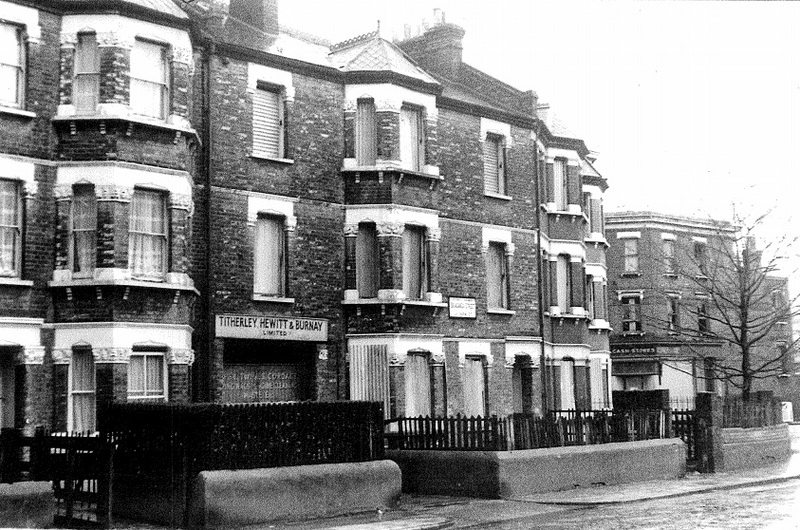 The picture below shows the housing that was ready to be demolished in 1978 (courtesy of the Southwark History Library Collection). Kevin goes on to say ‘Manor Place, where the Garden now stands, was a row of shops which was the same style on both sides of the road. At the top of Braganza Street there were seven three-storey houses with multiple occupation. Often these houses were leased by people such as Yates the builders’ merchants situated on the Walworth Rd. On the corner, there was a fish and chip shop, a launderette, vet, dentist, and florist. On Delverton Rd, (which was also the birthplace of comedian Charlie Drake). There were the bootmenders (people can still remember the hides being brought in ready to be cut up to mend boots and shoes!) There was also a dairy as at one time, cows were kept locally to provide milk for the local community. Other shops in this parade were a hardware shop, drapers, barbers and even a tailor, who used to make suits for Savile Row’. Walworth Garden first came into being in 1987. A group of local people were interested in creating an urban farm like the one nearby in Vauxhall. The site had been cleared around 1980 and it had been left with posts and wire fencing. No-one knew what to do with these sites and they just remained empty. Robert Hadfield, (garden founder and ex-trustee recalls, “a few of us decided to get together and said we could do better than this site with a wire fence and old floorboards”. Much of the housing in the area at the time was unoccupied such as the Pullens Estate, so the council had no incentive to bring land like that which Walworth Garden stands on back into usage. The garden came from the need to revitalise this empty space and effectively take it off the council’s hands. In 1982, three new young councillors were elected for the ward and they wanted to do things differently and animate spaces and the community in inventive ways. The area at this time was a very close-knit community but the recession of the early ‘80s and the changes to the printing industry affected the economy locally as many people lost their jobs. The area had gone through a decline and the land was not bankable so the people who came up with the idea of the garden such as Robert Hadfield were at the right place at the right time. Most of the people who were in the vanguard of transforming the garden had met at local Labour Party meetings and they were also helped in the initial stages by Southwark Environmental Trust. The Garden also involved lots of individuals from across the community who were interested in various elements of gardening and horticulture. At the time urban growing and farms were very much in fashion and then, like now, environmentalism and local food growing was sweeping cities like London. Kevin Williamson says, “I first heard about the proposed garden from friends who were involved in the local Labour party”. He soon became involved and began to work full time with a team of locals on clearing the site. The work started in about October 1987. During the cold winter that followed the onsite construction team would get warm huddling around fires in the old oil drums. In 1988 a young Harriet Harman and her children came along to open the site officially. In the wider community, there were mixed feelings about Walworth Garden Farm (as it was called at the time). Local people needed to be won over. As the community began to see the raised beds and polytunnels go in and the outreach worker in the community they began to be come on board. Next, the foundations for the drains were put in and the concrete poured for the timber framed building. This now houses the Horticultural Training Centre and offices. In time as the garden developed the site also took on a new floor plan as the neighbouring Territorial Army approached the Garden to suggest they swap a derelict piece of land in exchange for access at the back for their ambulances. This meant that the space where the potting sheds is presently situated was handed to the garden and the TA gained a new access point via Delverton Rd. When the TA put in the driveway, Kevin installed the back gates which now allow access to the Garden’s fleet of vans. As time went on a variety of gardeners and CEOs (Chief Executive officers) left their mark on the Garden and it’s activities within the community. Over the years they have added a bit of themselves into the fabric of the place and gradually grown the remit of the Garden. As it gained confidence and standing in the community, the Garden and its employees sought funding streams and diversified, creating the Garden Services Division and gaining maintenance contracts in the local community with organisations such as Southwark Cathedral and Southwark Council. This is still a strong and vibrant part of what the Garden does today and many of the trainees and apprentices who have been involved in this programme have gone on to work in places such as Kew Gardens and the Royal Parks. Walworth Garden has changed many lives and touched so many of those who have come into contact with it. Over the years, the Garden has seen many characters grace it’s lawn and flower beds. One example is Tracy Browne who came to do a Diploma in Horticulture and is still here, employed as Operations Manager. The initial idea for the Garden was a space that was an open and accessible green oasis and ‘lung’ for the community. The present CEO & Head Gardener, Oliver Haden has really reconnected the Garden to its original aims and he has flung open the doors so that the space is open seven days a week. It has become a place where people can come along to buy quality plants, get advice and have a calming cup of tea in what is the community’s garden and garden centre. The garden has a stable trustee board with a dynamic staff to direct the Garden towards the next 30 years. As Kevin Williamson says , “I’m looking forward to it growing and growing over the next 30 years”! garden today) [John Whelan is a freelance community and arts practitioner.